Zeno of Citium research papers examine the life and works of an ancient Greek philosopher who came from Citium on Cyprus and taught in Athens. 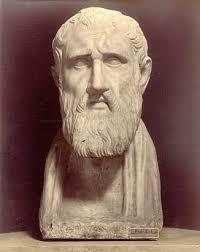 Zeno of Citium was an ancient Greek philosopher (c.334-c.262 BCE), who came from Citium on Cyprus and taught in Athens. Much of Zeno’s teachings were based on the Cynics, with a personal emphasis on peace of mind attained through a life of virtue in harmony with nature. Zeno’s teachings remained popular throughout the Roman Empire. The anecdotes of Zeno’s life that are known come from the third-century AD work Lives and Opinions of Eminent Philosophers. In that work, Zeno of Citium is described as merchant who is shipwrecked and eventually wanders into Athens, where he discovers the writings of Socrates in a bookstore. Physically, he is described as living the life of an aesthetic, which fits in with the traditional Cynic school of thought. In 301 BCE, Zeno began teaching publicly in the Stoa Poilile of the Agora of Athens, and his followers eventually became known as Stoics. Zeno’s teaching can be divided into three parts: Logic, Physics, and Ethics. Logic included his theories of perception and thought. Zeno’s Physics was concerned with the divine nature of the universe, including the idea that the whole of the universe was God. Under his ethical system, the goal of life was to achieve happiness through correct living in harmony with nature. “Happiness is a good flow of life,” was one of Zeno’s teachings. Unfortunately, none of his writing has survived except through a few quotations preserved by other writers. Western Philosophy research papers discuss the beginning of western philosophy and the famous philosophers that supported this philosophy. Stoicism research papers explain the philosophy, founded by Zeno of Citium, that taught that destructive emotions came about through errors in judgment and that the true intellectual would not suffer from such emotions. Philosophy Schools of Thought - When considering a field as profound as philosophy, there are several key schools of thought to examine. Paper Masters writes custom research papers on Zeno of Citium and examine the life and works of an ancient Greek philosopher who came from Citium on Cyprus and taught in Athens.